And I’m still getting to the good part! Some days, you just need to be boho pretty out in nature! Fission just released the new Set Free dress, and it’s so cute! There is a serious lack of boho chic/hippie chic mesh clothing in SL, so I was super happy to get this dress. It’s all kinds of my style! Elephante Poses and YumYums have paired up for the Sweet Nothing pose pack at the Pose Fair. There are 8 lovely poses in the pack, and a dandelion prop! I turned the dandelion around in my hand so the fluff blew away from me. I wore the Elyse hair by Truth in my post yesterday, but I had to wear it again today because it is so so me! I wear side braids quite a bit, and with the color change headband, I’m in heaven! I picked a daisy to attach to my headband for this picture, it doesn’t come on the band. Hopefully your weekend has been as nice as mine! Okay, tell me you haven’t been in this scenario. It’s the weekend, you’ve been invited out, and you have NOTHING to wear. So you run to a store and just start trying on EVERYTHING to try to find a new party outfit. It’s crazy! Luckily in SL, you have a whole inventory full of beautiful things. Although, if you’re like me, you still feel the need to run out and start buying new outfits just for one party. Have you been to Pose Fair yet? You should go! Savoir Faire made this cool Dressing Room pose prop for the event. You just sit on it and it has several cute poses. I adore pose props, so you know I’m totally into this one. Don’t forget to do the Fifty Linden Friday round today! Fri.day has a special color of the Venus heels. You honestly can’t beat some $50L heels! They are add-ons for the SLink medium feet. Hashtag Let Me Take A Selfie! So there I was, just walking around, and I ran right into Flat Ebbe Linden! What does anyone do in this situation? Take a selfie! Pose Fair 2014 starts on Saturday, and you guys are gonna love it! I’ve gotten a sneak peak at the place and it’s awesome! Soooo many awesome poses for all kinds of photos, including these new Selfies poses by Mien! I laughed when I saw the set and immediately just had to have it. It’s so me! Coldlogic released some new dresses this week and the Smart one that I’m wearing is quite smart! It comes with two different belts, solid like I’m wearing here, or checked like the details of the dress. This color, Sky, perfectly matches the Sarah sandals in mint that Fri.day has out at The Seasons Story. There are days where all you want to do is lay down near the ocean and read books. The Liasion Collaborative opened up for a new round of their awesome events and I was thrilled with the items from Sway’s and MudHoney for The Garden! Sway’s has a great pergola set called Garrison. It comes with options to have a floor or not [I’m showing it without] and also has a few pieces of furniture and decorations. It’s super cute! But I wanted to use it with the Tabatha lounge from MudHoney. This piece is gorgeous! There are plenty of animations in it, too, for sitting alone or with a friend or loved one. If you get the adult version, there’s naughty poses, too! Since the theme is Tuscany Hills for TLC, Lark is out at The Boutique with some Olive Crowns! I’m wearing it in Crown C because I thought the olives matched my outfit better, but there are different colors of olives, and one crown without the olives, just the leaves. So cute! Do you ever sit around thinking, “If I only had some pretty new shoes that are perfect for spring!” Wonder no more, because Fri.day is out at Collabor88 with some heels you neeeeed in your life! The Ella heels are just the sweetest little spring shoes! They’re small and delicate, so they’re pair up well with both sundresses and jeans. And really? Who can resist a shoe topped with a bow? Not me! You need the SLink medium feet for these shoes. Still don’t have them? Sorry for your luck! Who loves new stuff? This girl! There’s just something about opening up a new box of goodies that makes me happy. Let’s check some stuff out! L.Warwick released her new Miranda wedges last night and they are awesome! If you don’t use shadows, the texture reminds me of satin, but once you get your shadows on, they become glossy! The little white marks on the shoe in my photo are not painted onto the shoe, it’s actually sunshine! These are for the high SLink feet. FaMESHed and Collabor88 are fantastic this month! For FaMESHed, Cae has a jewelry set called Poise and I adore it. Dragonflies have always had a special meaning to me, so I can see myself wearing this set very very often. The gems and the metal both are color change via a nifty HUD. Truth is out at Collabor88 this month with the April hair. Isn’t it pretty?? The cute little bird barrette is detachable, and also color change through the hair color HUD. Valyrio muño ēngos ñuhys issa. If you’re a fan of the show, the Dany dress and cloak is familiar to you. If you’re not, it’s okay! It’s still a marvelous outfit! The back of the dress has a large oval cut out, and there are 2 options for the dress – with or without the cloak. There are also several colors to choose from. Even if you’re not much for RP, you should still check out We♥RP! Lots of goodies for you! Our beach vacation is over and we’re heading home today. I’m so going to miss this place! But at least I got in one more morning walk along the beach. Mutresse is at FaMESHed this month and I’m loving the Nadya tank top and Guzia shorts! The top comes in 2 options so that if you wear the shorts, the belt of the shorts won’t clip the top, which is awesome. And like other Mutresse products, both items come with handy color change HUDs so you can customize your look. Maxi Gossamer is also at FaMESHed and how beach perfect are the Bali Gypsy bare foot sandals and necklace, I ask you? I haven’t put on shoes in at least 2 days because I just want my feet to be all jeweled up and pretty. You DO need the SLink flat bare feet for these, so if you’re still in janky system feet, then your feet can’t be as jeweled up and pretty as mine today. I guess it’s time to pack up and start heading home. If you’re interested in your own awesome beach vacation on this beautiful little island, contact Vernice Burks or Mariah Urriah to set something up! 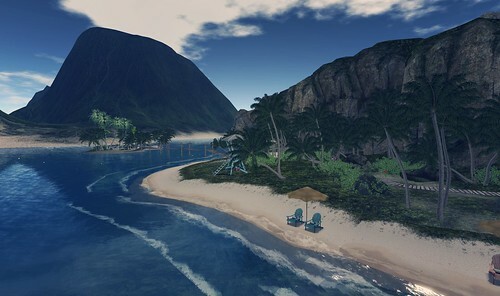 Photo taken at Tangle Island Tropical Paradise. Contact Vernice Burks or Mariah Urriah to make a reservation! !